When it comes to Gold, there is actually too much focus or incorrect focus on the US Dollar. The fact is that throughout this bull market, Gold has been leading the US Dollar. In other words, the breakouts in Gold occur well in advance of the breakdowns in the dollar. Also, bottoms in Gold occur in advance of tops in the dollar. See the chart below. Just take a look at this year! 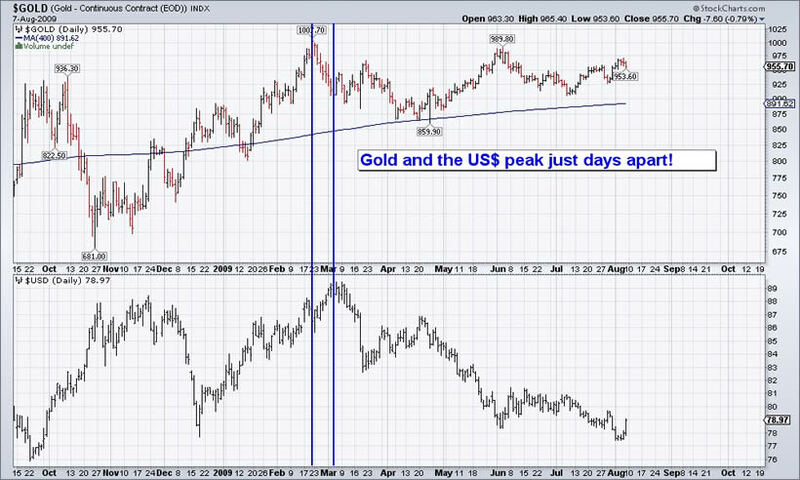 The peaks in Gold and the dollar occurred within days of each other! The bottom in Gold occurred four months prior to the top in the dollar. A falling dollar is not necessarily a good thing for the leverage in gold shares. 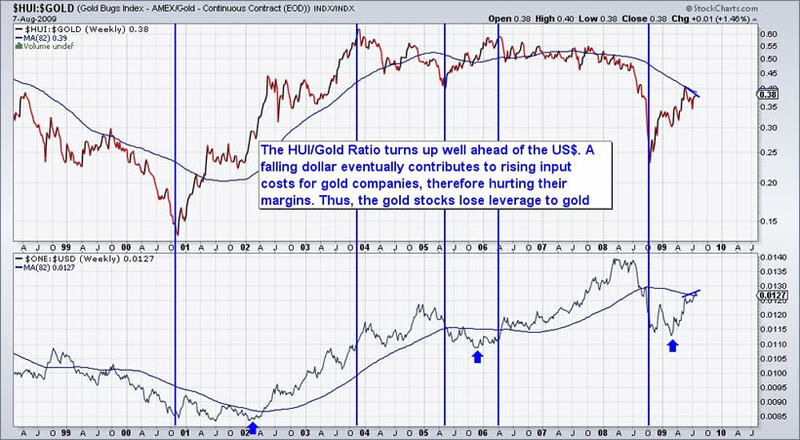 In this chart, I compare the HUI/Gold ratio to the US Dollar (inverted). We can see that the dollar significantly lags the HUI/Gold ratio. By the time the dollar starts to fall (rise in the lower chart), gold shares have already gained materially against Gold. There are two reasons why a falling dollar isn’t necessarily positive for gold shares. First, many gold companies operate outside of the USA. A falling dollar means stronger local currencies, which means higher costs. Second, after a while a falling dollar creates cost inflation, which ends up hurting the margins of gold companies. 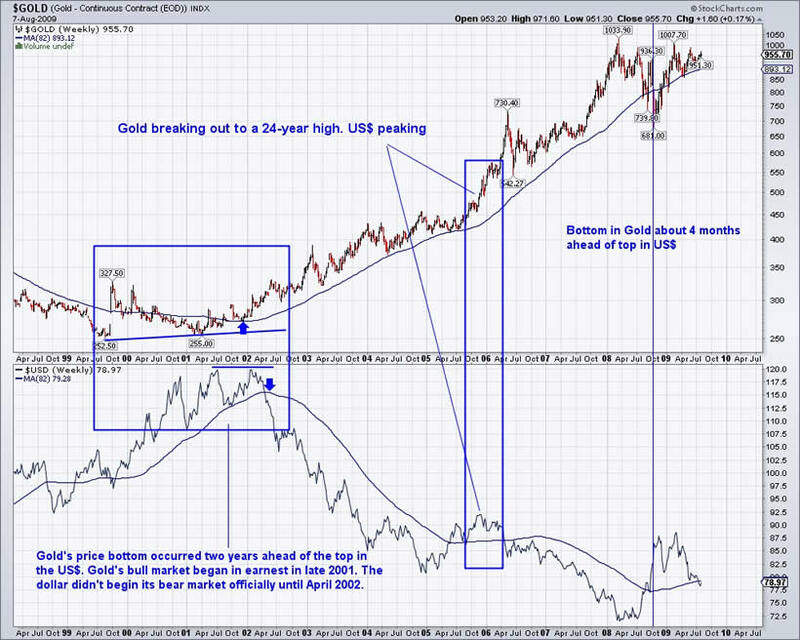 A significant breakdown in the US Dollar will come AFTER a major breakout in Gold. Gold has been consolidating for months, even as the dollar has trended down. The recent bottom in the greenback confirms that Gold is still in a consolidation phase. In March we asserted that Gold wouldn’t break 1000 because money would pour into stocks and commodities, thereby diverting Gold’s strength. Gold’s relative strength has been poor due to the ensuing recoveries in stocks, commodities and foreign currencies. In recent weeks we noted this to subscribers as well as the fact that dollar sentiment was too bearish. Hence, we didn’t see a major breakout in gold or a sustained breakdown in the dollar. Where will demand come from (to push Gold to breakout) if Gold is underperforming currencies, commodities and stocks? In other words, money is favoring the other asset classes. This is why relative strength matters. And it also matters because it shows the “real” price of Gold (something that Bob Hoye talks about). If Gold is rising against foreign currencies, oil and commodities it means stronger leverage for the Gold companies. We can compare and contrast all of these things with charts. Technical analysis is very effective if you know how to use it.